When I taught geometry, I loved to introduce students to the work of Dutch, graphic artist M. C. Escher (1898-1972). His tesselations and intriguing art capture the interst and imagination of students and adults alike. This two-minute Waterfall video is one example. 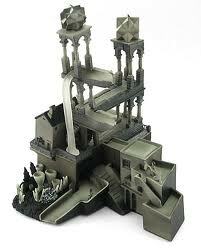 Head over to the Escher website to see and learn more about his work.